Tom and B'Elanna are my all time favorite Trek couple. They are made for each other. Tom can handle B'Elanna's Klingon side. B'Elanna has helped Tom become the man he is. Their personalities complement each other. Everytime they are on the screen together, you can see the chemistry they have. -- Set in fifth or sixth season. Tom and B'Elanna surprise the crew by announcing they are engaged. -- Set in fifth or sixth season. Sequel to "Evening of Enchantment." Tom and B'Elanna's wedding. -- Third in the Enchantment series. Tom and B'Elanna are expecting their first child. 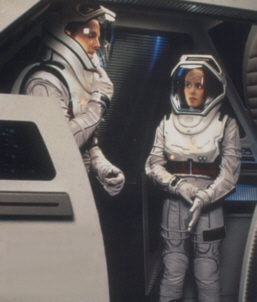 -- Tom reveals to B'Elanna why he has a fear of enclosed spaces. -- Set during "Unimatrix Zero". Tom and B'Elanna's last night together before she is assimilated. -- One of two possible letters from Owen Paris to his son. -- The second possible letter from Owen to Tom. -- When B'Elanna's period wrecks havoc with her body and emotions, Tom lends a hand.